This book challenges the conventional wisdom of international policing in transitional societies which seeks to strengthen the state police. It builds on a growing body of literature on the pluralization of policing in Western democracies and transitional states which contends that the state police is merely one security provider in a complex policing landscape. 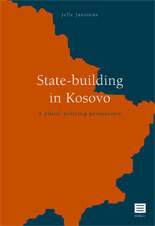 Through a case study of Kosovo, this book proposes possible forms of plural policing and the relationship between state-builders and non-state policing agents such as private security companies, gangs and Kanun-based policing systems. The book provides insights in the field of (plural) policing in transitional societies and overall policing strategies used by the international community in Kosovo. Jelle Janssens (1981) is a criminologist (2005), holds a master in Public Management (2006) and a Ph.D. in Criminology (2013). He is a researcher at the Department of Criminology, Criminal Law and Social Law of the Faculty of Law (Ghent University) and a member of the Institute of International Research on Criminal Policy (IRCP). His research interests focus on policing in post-conflict environments, (international) criminal policy and law enforcement, community policing and plural policing.